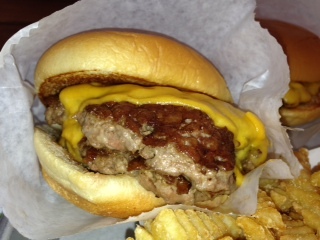 Description: U.S. burger joint that has opened its first UK location in Covent Garden. It originated as a hot dog cart in New York and is known for its frozen custard desserts known as "concretes". Located inside Covent Garden piazza, the restaurant is actually the size of a very small shop with a takeaway counter inside. The seating is outside; you take a buzzer and it lets you know when your food is ready. Perhaps because it's new, it's extremely busy at the moment - we got there at 5.45 and didn't queue, but got the last table; by 6pm there was a long queue outside. Reason for visit: I'd recently been to Five Guys, a U.S. burger joint that just opened its first UK location in Covent Garden... and while fans would say the two are completely different, I wanted to try them out to compare. We were going to the theatre nearby and needed a quick dinner so this was the perfect opportunity. Also, in How I Met Your Mother, Lily gives one reason for not wanting to leave New York as "a Shake Shack finally opened on our block!". If it's good enough for Lily, it's good enough for me. 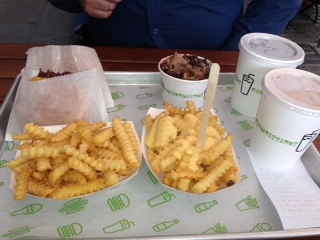 I ate: Cheeseburger, Cheese Fries, Union Shack Concrete: chocolate custard, chocolate brownie from St. John bakery, fudge sauce, chocolate chunks from Paul A. Young, sea salt. The food was: Delicious, but then I do like a good burger. 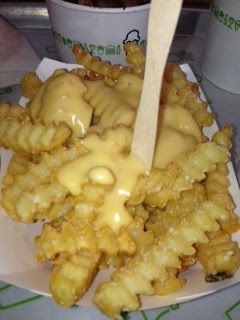 Well cooked, the bun held together well, and the cheese sauce on the fries was so good I didn't want to share. 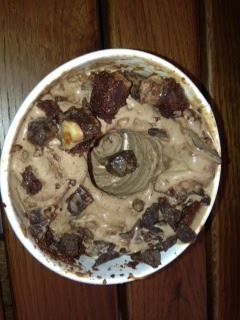 The "concrete" was interesting - it looked and tasted like ice cream rather than custard. The brownie and chocolate chunks in it were very nice, but the whole thing melted before I got to eat it (it wasn't even a very hot day), prompting my boyfriend to say it tasted just like his chocolate milkshake. The atmosphere/service was: I wouldn't say this place has much atmosphere as it's just basically a takeaway counter, but sitting outside amid the buzz of Covent Garden is nice. Service was friendly - as mentioned above, you take a buzzer and collect your own order, but someone clearing tables spotted we had forgotten to get a spoon for the concrete and fetched us one. In fact she got us two, as she guessed we were going to share. Price range/value for money: The meal cost £30, which seems like a lot when you are carrying a plastic takeaway tray - but you shouldn't compare this to McDonald's. If the food was brought to the table on a plate, like in Byron, paying £30 for it would seem perfectly normal. The food is definitely worth the money. Would I recommend it? Yes, to try once as the food is really tasty - but the long queues and no guarantee of a table would put me off going again, unless I was passing and saw it wasn't too busy. It does sound worth a visit. You will have to read Dom's kind-of-review of Five Guys. Very funny!